Madagascar, Tunisia, Egypt qualify for Africa Cup of Nations - SABC News - Breaking news, special reports, world, business, sport coverage of all South African current events. Africa's news leader. 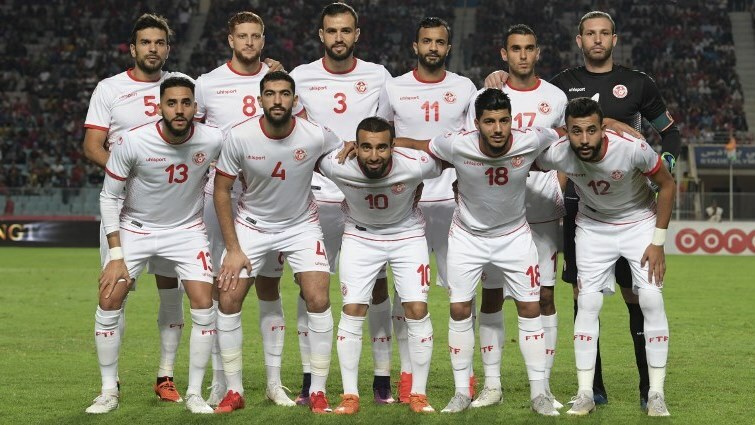 (Top L to R) Tunisia's Oussema Haddedi, Fakhreddine Ben Youssef, Hamdi Nagguez, Taha Yassine Khenissi, Elyes Skhiri, Farouk Ben Mustapha, (bottom L to R) Dylan Bronn, Yassine Meriah, Naim Sliti, Bassem Srarfi, and Ayman Ben Mohamed pose for a group picture ahead of the African Cup of Nations Group J Match between Tunisia and Niger at the Rades Olympic Stadium in Rades. Madagascar, for the first time, and former champions Tunisia and Egypt sealed places at the Africa Cup of Nations finals Tuesday. Njiva Rakotoharimalala scored four minutes before half-time to earn Madagascar a 1-0 Group A victory over Equatorial Guinea on the huge Indian Ocean island. Tunisia and record seven-time title-holders Egypt secured slots in Cameroon next June with away victories in Group J over Niger and eSwatini (formerly Swaziland) respectively. Victory lifted Madagascar to 10 points from four games and beyond the reach of Equatorial Guinea and Sudan in a four team mini-league from which the top two qualify. They qualified despite having to play a preliminary tie, which they won 4-2 on aggregate against Sao Tome e Principe, and being seeded last behind Senegal, Equatorial Guinea and Sudan. Senegal will also secure a place among the 24 finalists if they win away to pointless Sudan in a late kick-off. Qualification for the Malagasy came after 18 failed attempts, with French coach Nicolas Dupuis’ most common starting eleven made up of four players based in France, one each in Algeria, Belgium, Egypt, Reunion, Saudi Arabia and Thailand, and one local. After Chaout netted twice within four minutes, Youssef Oumarou pulled one goal back before half-time for Niger, who could not prevent Tunisia maintaining their perfect record. Egypt were far too good for eSwatini despite lacking injured star Mohamed Salah, who strained a thigh muscle during a win over the same opposition in Cairo last Friday. Lebo Mothiba was foiled by the woodwork just after half-time and South African team-mate Percy Tau had a goal disallowed in a marginal offside decision soon after. South Africa top Group E with eight points, but Nigeria can overtake them later Tuesday by defeating Libya. This entry was posted on 16 Oct 2018,09:54PM at 9:54 PM and is filed under Sport. You can follow any responses to this entry through the RSS 2.0 feed. Both comments and pings are currently closed.